Hello ladies! Wow, I've been trying to blog this post for 3 days! lol. 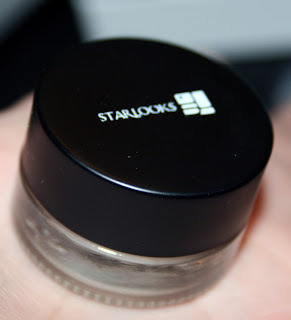 I wanted to share with you my September Starlooks Starbox. It's a unique box that comes from the States. The difference between this subscription and others is that it comes with full size products from their own line. Generally, you receive 3 products. Now, this box is a little more expensive...but you are getting a really good quality item. The subscription is $15 a month. If you're in the US this includes shipping. Canadians, it is, I believe $3 for shipping. Which to me is still reasonable. Maybe, in the future they will offer us free shipping as well! Each box comes with a quartz crystal. 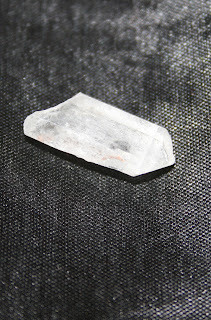 This month my crystal was so itty bitty! Not that it's a big deal...but I do want to put them in a pretty glass jar and if they're all 10mm long that will take forever! 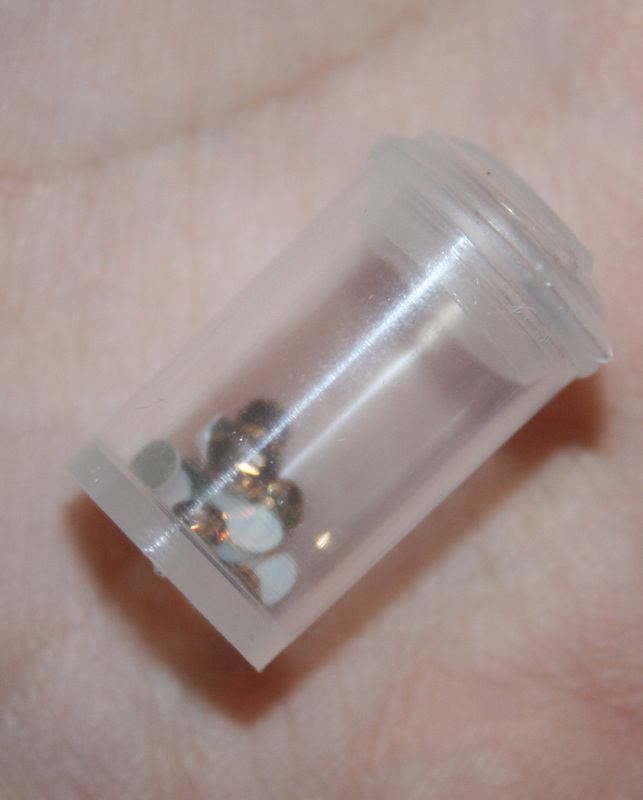 As an extra they threw in this little container of eye jewelry. I love the concept of these, but even if I was going out somewhere super special..I think I may be a bit too old. 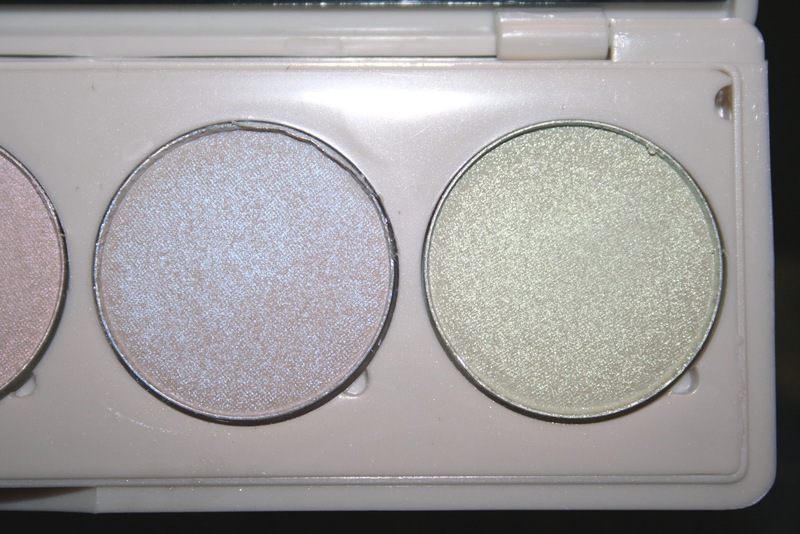 They come in opal and champagne. 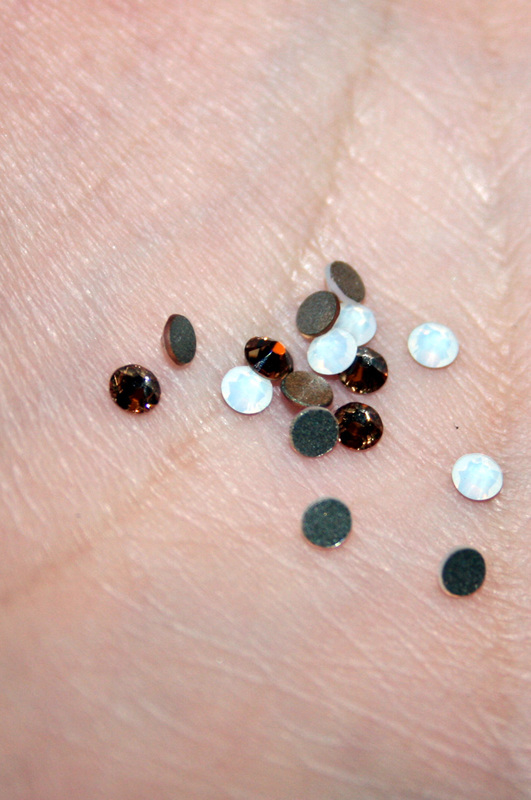 They are Swarovski flat back crystals. So, the first item leads up to the other item in the box. 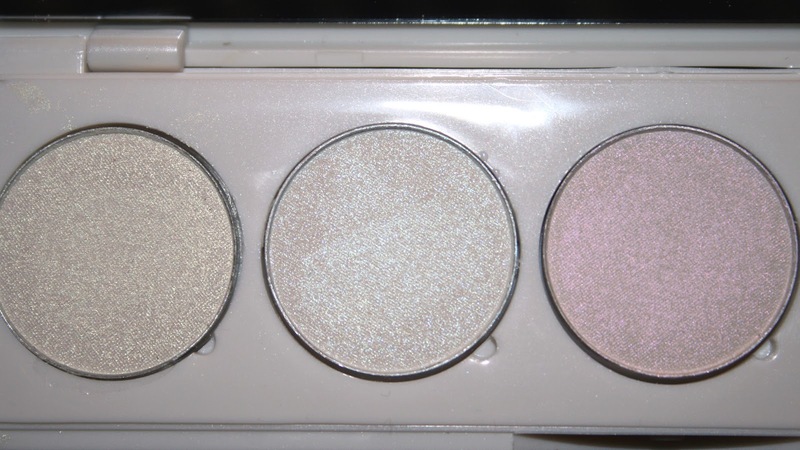 It's a clear eye shadow primer. Since they often don't have the identical products and there's no prices listed this month I can't give you any idea of that. 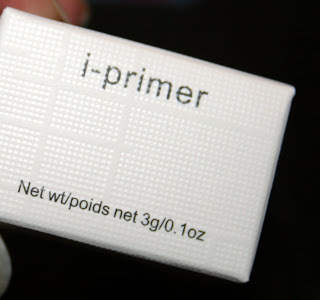 There face primer is $15 on the site. I realize that for a lot of people primer for the eyes is important...for me, I don't feel like I need it...so this was a bit of a bummer product. When I use my concealer I do my eyelids as well because they have a dark pigmentation to them. 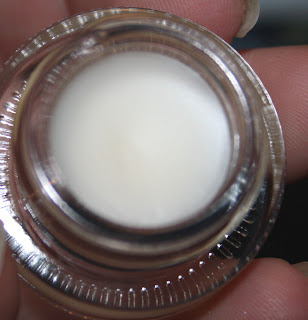 I find that my Vichy concealer works great as a primer. As you can see the product is clear. Which is probably really good for a primer. Next item I was super excited about. It's the monographic 5 shade shadow pallete. I just love their sleek packaging! Inside was this gorgeous pallete. Quite heavy and very classy. I love how the logs is just small and unassuming... I couldn't wait to open it. Annd...tada!! Ok. 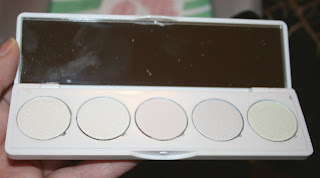 So I know EVERYONE was super excited about this palette. I was actually bummed. I'm not really into these pastely/irridescent/opalescent sheens of colour. I'm really trying to love it because they ARE pretty colours. I'm just really underwhelmed. But, again..that's just me. They don't have this pallet on the site but their other 5 shade pallets retail for $30. 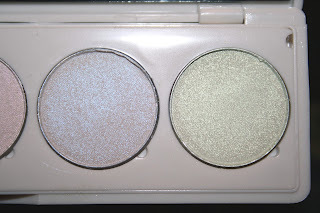 This is what they say: "Each shadow is an opalescent sheen of colour for the eye base. These colours can be used alone, or combined with any other matter or shimmer shadows from the Starlooks collection, to enhance or alter colour." Now, I'm not a makeup artist so that may be lost on me... I generally put a base colour and then a crease colour...for daily makeup I generally just wear a light pink or peach colour on my lid and that's all. Here is a closeup of the first 3 colours. 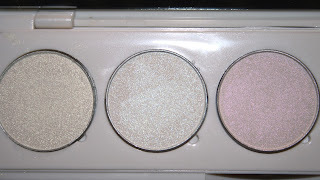 The first one is gold, the second white, the third pink. I tried the gold colour on my lids and it actually looked pale green in some lighting... not sure it ended up looking gold at all. That said, it is good quality and lasted a long time. As, you may be able to see the colours are irridescent. So, it can give the effect of multiple colours in one. Here are the other two colours. A purple and a green. So, all in all it was a great box with a great value...it just wound up being not my favourite. 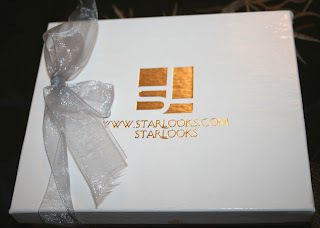 I enjoy the service from Starlooks and have loved my previous 2 boxes so I will continue subscribing! There you have it! If you want to subscribe, I'd appreciate it if you used my name as a referral (Aleksandra Sokal) when you sign up. I believe if you are a Canadian (or other International) you have to email them directly to sign up. Very cool box! I like the idea of companies doing subscription boxes of their own products! Great idea. Yeh, it's really neat to get full size makeup items! Aww, I'm sorry you didn't really love this month's box. 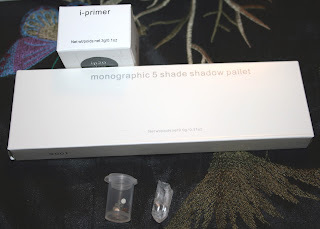 The primer though is absolutely fab - none of my shadows crease when I use it! That is good to know! I used it once but I think I may have put a little too much on. I also made the mistake of using my concealer brush and not washing it immediately..it was extremely difficult to clean the next day... Think glue in the brush. Since Glossy Box jacked up their price Im looking for a new box. This might be one to check out. I would rather get makeup products each month then random samples anyway. great post! Yes, this one is definitely worth it! You're getting quality products for sure. Plus, word on the street is they have a past MAC chemist or something along the lines working with them.